What is myr file? How to open myr files? Thy myr file extension is associated with the Harmony Assistant application for computer assisted music composition and editing. 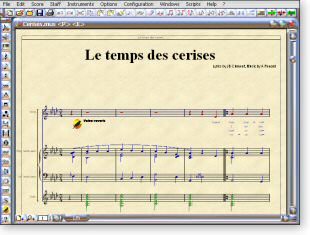 The myr file contains music notation and instructions used to compose music. 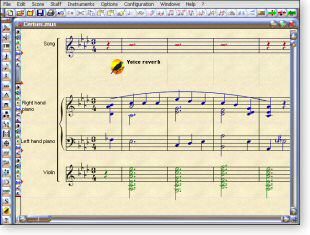 Harmony Assistant is a software for computer-assisted music composition and editing. Harmony Assistant comes with its own embedded software synthesizer (SoftSynth), which provides high quality output on basic sound cards, even without any external MIDI device, and includes hundreds of different instruments. Melody Assistant is used to music writing, printing and rendering. Use Harmony Assistant to open and work with the *.myr files. Harmony Assistant can export myr notations to WAV, MP3, or MID audio. and possible program actions that can be done with the file: like open myr file, edit myr file, convert myr file, view myr file, play myr file etc. (if exist software for corresponding action in File-Extensions.org's database). Click on the tab below to simply browse between the application actions, to quickly get a list of recommended software, which is able to perform the specified software action, such as opening, editing or converting myr files. Programs supporting the exension myr on the main platforms Windows, Mac, Linux or mobile. Click on the link to get more information about listed programs for open myr file action. Programs supporting the exension myr on the main platforms Windows, Mac, Linux or mobile. Click on the link to get more information about listed programs for edit myr file action. Programs supporting the exension myr on the main platforms Windows, Mac, Linux or mobile. Click on the link to get more information about listed programs for play myr file action. Programs supporting the exension myr on the main platforms Windows, Mac, Linux or mobile. Click on the link to get more information about listed programs for convert myr file action. Programs supporting the exension myr on the main platforms Windows, Mac, Linux or mobile. Click on the link to get more information about listed programs for create myr file action. Programs supporting the exension myr on the main platforms Windows, Mac, Linux or mobile. Click on the link to get more information about PDFtoMusic for export myr file action.